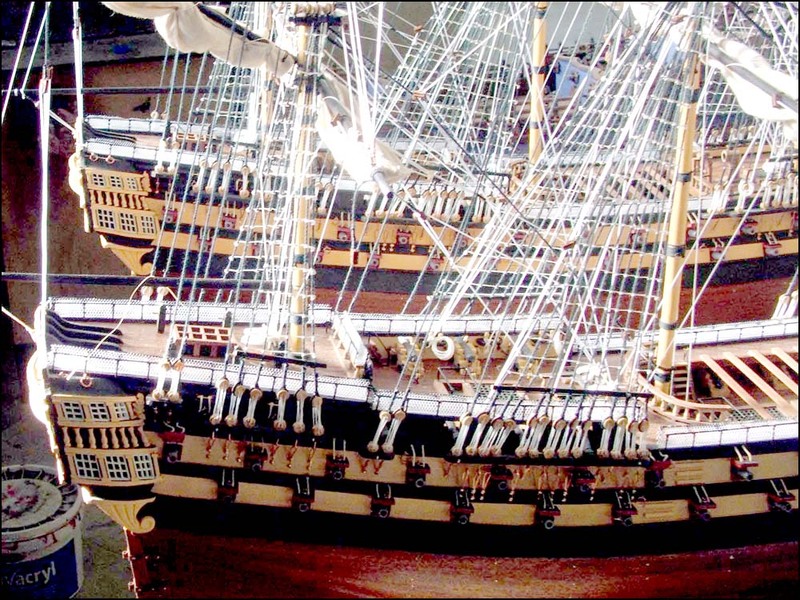 This beautiful ship model has detailed rigging, deck, bow plus copper plated hull. The most famous British period ship, The HMS Victory, was laid down on 23rd July 1759 and launched on 7th May 1765 at Chatham Dockyard (Kent). The HMS Victory was launched in 1765 at Chatham Dockyard and was commissioned in 1778. She was the fifth ship to be bear that name. The battle honours include: Armada (1588), Dover (1652), Portland (1653), Gabbard (1653), Scheveningen (1653), Four Days Battle (1666), Orfordness (1666), Sole Bay (1672), Schooneveld (1673), Texel (1673), Barfleur (1692), Ushant (1781), St. Vincent (1797), Trafalgar (1805). She became famous when in October 1805 she served under Vice-Admiral Lord Horatio Nelson during the battle of Trafalgar. She carried 104 guns at Trafalgar and was manned by a crew of 821 ready for battle and sworn to defend King and Country at any cost. The gunners could fire and reload all guns within 90 seconds and fired solid rounds that could penetrate 3 feet of oak causing high casualty numbers due to wooden splinters. In 1805 Napoleon ordered Admiral Pierre de Villeneuve to unite with other French ships at Cartagena in the Mediterranean. However, Villeneuve was aware that a fleet of 29 British ships of the line was in the area and that the Franco-Spanish fleet would suffer losses if battle ensued. Napoleon accused Villeneuve of cowardice so on October 20th the French admiral set sail from Cadiz. Nelson’s fleet effectively prevented the Franco-Spanish fleet from entering the Mediterranean Sea and forced them into battle off Cape Trafalgar in southwest Spain on 21 October. Villeneuve had more warships than Nelson (33 to Nelson's 29) and was confident this would give him victory. He ordered his fleet to sail north in a single, irregular line. Nelson (in a prearranged plan) split his fleet into two squadrons and attacked the centre of the Franco-Spanish line at right angles. Visit HMS Victory and see the spot where Vice-Admiral Lord Nelson fell, get the chance to meet Captain Hardy and find out about life onboard. If the delivery address is outside above-mentioned countries, please email us to request a shipping quote. Please ensure you provide at least the country, city, and postcode. If the delivery address is in the USA, please also provide the name of the state.